Scientific Names:Berberis vulgaris L., B. aquifolium Pursh. Mahonia aquifolium Nutt. Common Names: Barberry, Oregon grape, trailing mahonia, berberis,jaundice berry, woodsour, sowberry, pepperidge bush, sour-spine. Barberry (Berberis vulgaris) is a shrub in the family Berberidaceae, that is native to central and southern Europe, northwest Africa and western Asia. Barberry grows in the wild but has gained popularity in Europe and US as a garden plant, commonly used as hedge or plant fence due to its thorny, wiry branches. Barberry has long been used in herbal medicine since the Middle ages, used to treat liver and gallbladder disorders. Barberry shrub grows to about 4 meters in height. Barberry leaves are of variety of shapes about 2 to 5 cm long, the primary leaves are three-forked spines, while secondary ones are oval, subtended by a three branched spine. Barberry flowers are bright yellow that bloom between April to June. The flowers are about 4–6 mm across, produced on 3–6 cm long panicles. Barberry bears red, edible fruits that are oblong in shape about 7–10 mm long and 3–5 mm in diameter. Barberry fruits are very sour that ripens in late summer or autumn. Barberry fruit is rich in vitamin C.
Medicinal use of barberry dates back more than 2,500 years. Barberry has been used in Indian folk medicine to treat diarrhea, reduce fever, improve appetite, relieve upset stomach, and promote vigor as well as a sense of well being. Today, Barberry is widely used for medicinal purposes, including for biliary disorders (such as gallbladder disease) and heartburn. The herb, which helps digestion and reduces gastrointestinal pain, comes in the form of capsules, tinctures, topical ointments and fluid extracts. Dried barberry roots can be used to make tea. Barberry has many benefits, but it can cause nausea, vomiting, convulsions and dizziness if not taken correctly. Barberry can be poisonous to children, pregnant women or lactating women. Consult a doctor before taking barberry to treat a medical condition. There are over 500 kinds of Barberry bushes. The two most common forms of barberry bushes in the US are the Common Barberry and the Japanese Barberry. The Common Barberry is used for landscape gardening and grows as a wild bush in the eastern region of the United States. Barberry grows berries in a bunch. The Japanese Barberry is a famous garden plant where berries grow either single or in pairs. Is Barberry healthy? The answer of course is a resounding yes. Barberries have a number of health and nutrition benefits. The chemical composition of this herb makes them highly nutritious and perfectly suitable for human use. Barberry berries have Vitamin C in them in a generous measure. Vitamin C helps clear toxins away from the body. It helps maintain strong teeth and bones. Barberry is also needed by the body for a glowing, healthy skin. Athletes have begun to realize the importance of Barberry and have started to incorporate into their diets to speed up healing, support tissues, get relief from colds and get back vigor after intense workouts. Barberries are rich in the chemical Berberine which boosts the immune system and cell functioning. Barberry prevents bacterial infection of the human cells. Barberries are a rich source of acids which helps flush extra water and toxins out of the physical system. Barberry has been used as anti-inflammatory and Antifungal agent and is used to ease inflammation and infection of the urinary tracts and, gastrointestinal tract. Barberry is considered effective in treating bacterial diarrhea. Barberry is effective in treatment of respiratory tract infections like sore throat, nasal congestion. 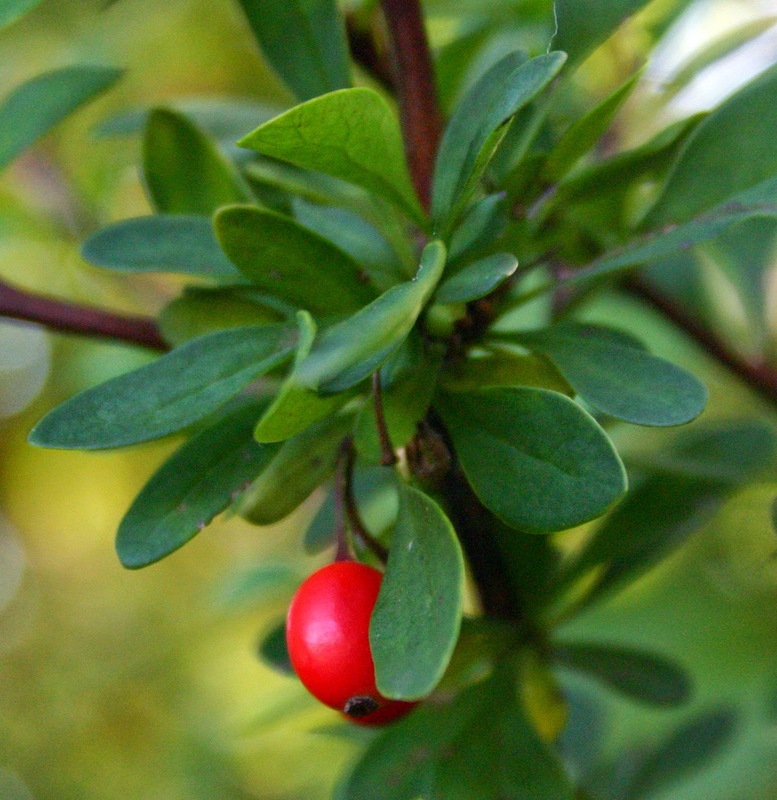 Barberry is used to treat candida (yeast) infections, psoriasis, and other skin infections. Compress containing Barberry is used during conjunctivitis or inflamed eyelids. Barberry is used to promote vigour and immunity. This is attributed to alkaloids present in barberries which are proven to combat infection, bacteria and increase immunity. Barberry is hepatic, purgative, laxative, tonic and stomachic in nature; it increase flow of bile and eases disorders related to gallbladder and jaundice. Barberry may offer protection against Type 2 diabetes. When used along with milk thistle, helps stabilize blood sugar levels and treat diabetes. Barberry extract used in a salve may reduce symptoms of psoriasis, but there is currently not enough clinical evidence to support this claim. The flowers and the bark of Barberry are anti-rheumatic in nature. Barberry can be an effective cleanser for the liver. It has the ability to promote the flow of bile and correct liver function. According to Vitamins & Health Supplements Guide, "Barberry has long been used to stimulate bile secretion and the liver in general, as a bitter digestive tonic, diuretic, alterative, and immunostimulant." Barberry can be an effective treatment for diarrhea. It helps the treatment of diarrhea because it contains astringent properties. Barberry can be a quick remedy for diarrhea symptoms. Barberry can be an effective treatment for bladder, urinary, yeast and gastrointestinal infections. It can also be used to treat a sore throat, sinusitis, bronchitis, nasal congestion and respiratory inflammation. Gargling with a Barberry mouthwash can be useful in providing relief from Pyorrhea, sore throat, mouth irritation and throat irritation. Barberry can also help strengthening the gums. Barberry may be beneficial to the cardiovascular and neural systems and may be used as a treatment for epilepsy and convulsions. It has also been used as an alternative treatment for tachycardia and hypertension. As with other herbs containing berberine, barberry should not be used by pregnant women because it is a uterine stimulant. No studies have been done on the safety of barberry in nursing women and therefore it is probably best to avoid using barberry while nursing. Used in appropriate doses, barberry has no reported side effects. In excessive doses it may cause nosebleed, diarrhea and vomiting. Barberry may also cause kidney problems. Pain during urination, blood in the urine and low back pain are symptoms of kidney problems and should be reported to a doctor immediately. Barberry may interact with other medications, so it is important for patients to advise their doctor if they are taking barberry. Patients who are under the care of a doctor and taking prescribed medications should not take barberry until they have discussed it with their doctor. Before taking barberry as a remedy, patients should discuss the medical condition and therapeutic benefits with a doctor or herbalist. The concurrent use of berberine (a constituent of barberry) and antibiotics may have additive effects. Consult with a qualified healthcare professional, including a pharmacist, before combining therapies. Barberry has displayed anticholinergic activity. Theoretically, combination use of barberry with anticholinergic agents may increase these effects. Examples of anticholinergic herbs include bittersweet (Solanum dulcamara), henbane (Hyoscyamus niger), and Jimson weed (Datura stramonium). Berberine may increase platelet formation, therefore caution is advised when using herbs or supplements that may have competing effects. Berberine has been shown to decrease blood pressure. Patients taking blood pressure lowering medications should consult with a qualified healthcare professional, including a pharmacist. 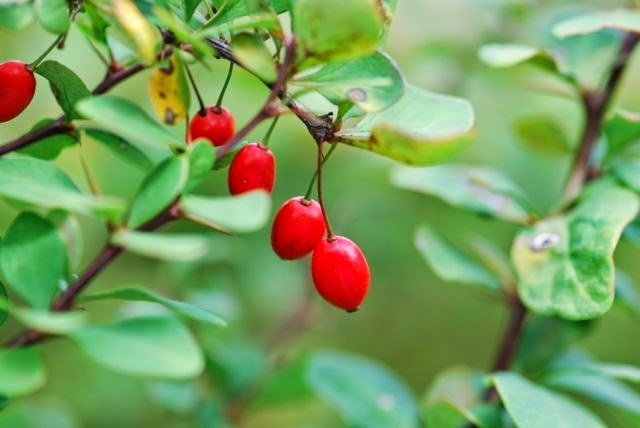 Use with other herbs containing berberine may increase the risk of berberine toxicity. Examples of berberine-containing herbs include bloodroot, goldenseal and celandine. Barberry contains vitamin C and may have a mild diuretic effect due to the acid content. Theoretically, barberry may increase the effects of other herbs with potential diuretic effects. Caution is advised. Preliminary evidence shows that barberry may interfere with the way the body processes certain drugs using the liver's "cytochrome P450" enzyme system. As a result, the levels of these drugs may be altered in the blood, and may cause different effects or potentially serious adverse reactions. Berberine may lower blood sugar levels. Caution is advised when combining with other herbs and supplements that may also lower blood sugar. Theoretically, concomitant use of berbeine may have additional effects with other sedative agents. 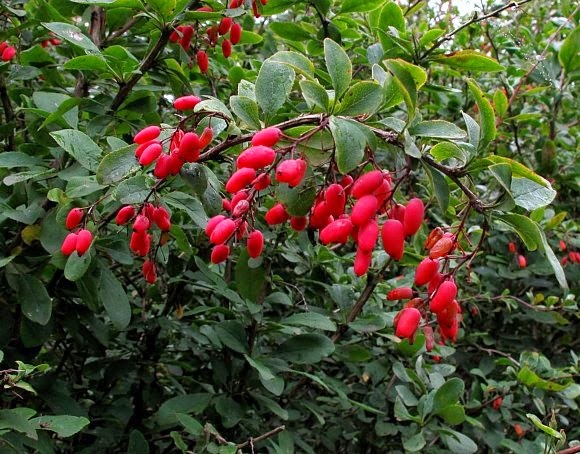 Berberine may cause drowsiness and motor impairment. Caution is advised when using in combination with other herbs or supplements that have sedative effects, such as chamomile. Yohimbine, a constituent of yohimbe, and barberry competitively interact for binding sites. In addition, due to the anti-fertility properties of berberine, use of yohimbe for the purpose of procreation may not be effective. Berberine may decrease the metabolism of vitamin B, and caution is advised.